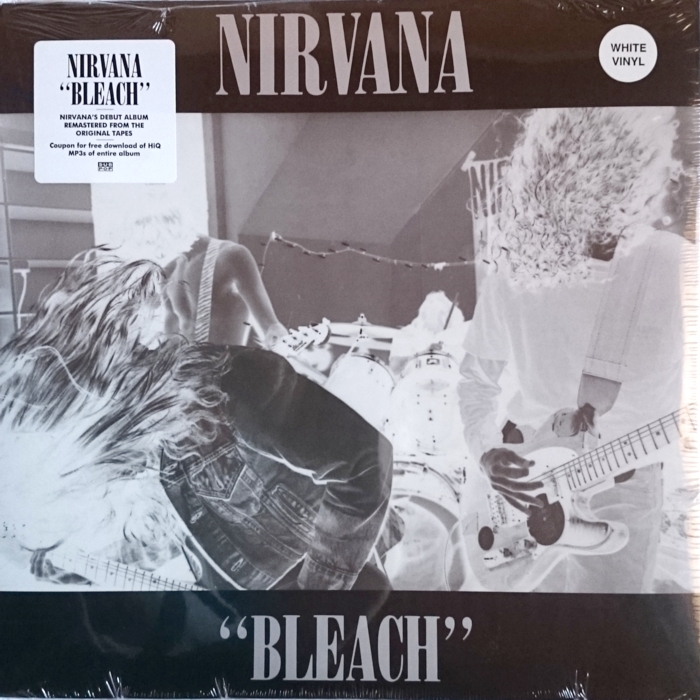 Record Technology Incorporated, RTI, have pressed several Nirvana reissues, among them the first Original Recordings Group reissues and Sub Pop's 20th anniversary reissue of Bleach . Metal plates processed by RTI are marked with an internal job number followed by side and processing method information . As an example Nevermind (ORG-032) has the numbers "18200.1/2(3)". The numbers seem to be handwritten into the lacquers before plating, due to smoothness and depth. These numbers do not necessarily determine that the record in question was pressed by RTI, only that they processed the metal plates. The remastered Bleach 20th anniversary 2LP reissue (SP 834) was pressed by RTI on heavy-weight vinyl. They also pressed the single LP reissue (SP 034) on black regular weight vinyl. Around 2011, when they were going to press a batch of the black single LP records, RTI accidentally pressed some on white vinyl. They were packed in single LP sleeves, sealed, and "white vinyl" stickers were put on. About eight to ten copies were pressed before they caught it. None of them were sold. Judging by the weight of the sealed record, it seems to be on heavy-weight vinyl. The heavy-weight and regular weight pressings have different matrix codes. As this mispress appears to be heavy-weight, the matrix codes are most likely the same as those on the first disc in the 2LP release.